clear, well-defined tone, unstoppable sustain and precise articulation + a bolt-on bass you can buy. Clear, well-defined tone, unstoppable sustain and precise articulation. That is the best way to describe the Killer B Tobias Bass Guitar. Featuring a five-piece asymmetrical neck, this musical instrument was designed to offer Tobias performance and sound for those players who prefer a bolt-on bass you can buy. Besides a great name, it features a 5-piece Asym neck with dual truss rod and mother-of-pearl position markers on a pau ferro fingerboard. 2-piece body in a choice of woods. Dual Bartolini pickups. Controls include mid cut/boost, pickup blend pan, master volume with push/pull slap switch. Grover tuners. Black hardware. Includes hardshell case. the finest bolt-on you can buy. Clear, well-defined tone, unstoppable sustain and precise articulation are the hallmarks of the. That is the best way to describe the killer b Tobias Bass Guitar. Featuring a five-piece asymmetrical neck, the Killer B was designed to offer Tobias performance and sound for those players who prefer a bolt-on bass you can buy. Besides a great name, it features a 5-piece Asym neck with dual truss rod and mother-of-pearl position markers on a pau ferro fingerboard. 2-piece body in a choice of woods. Dual Bartolini pickups. Controls include mid cut/boost, pickup blend pan, master volume with push/pull slap switch. Grover tuners. Black hardware. Includes hardshell case. Be a killer bass player! you’ll get everything from killer slap to punchy Latin tones, and every sound in between + the least expensive. The most versatile one-pickup bass ever. Don’t be misled by the price! This may be the least expensive American made Tobias bass guitar, but even the wealthiest players will want to add this bass to their arsenal. The American-made Growler features one large, quad-coil custom-designed Bartolini pickup mated to an 18V, dual-channel stereo preamp. Add to this a pair of custom-designed tone shaping switches, and you’ll get everything from killer slap to punchy Latin tones, and every sound in between. 24-fret, double-octave range. Wenge fingerboard. Massive ABM brass bridge. Swamp ash body. Includes hardshell case. Whatever your style, you’ll love this bass. The Tobias Growler Bass Guitar is the most versatile one-pickup bass ever, you’ll get everything from killer slap to punchy Latin tones, and every sound in between. the least expensive American made Tobias + provides tonal qualities that are unmatched in any price range. Don’t be misled by the price! This may be the least expensive American made Tobias bass guitar, but even the wealthiest players will want to add this bass to their arsenal. The swamp ash body and custom pre-amp/pickup designs provide tonal qualities that are unmatched in any price range. Upgrades include a brass ABM bridge, mother of pearl logo, one large, quad-coil custom-designed Bartolini pickup mated to an 18V, dual-channel stereo preamp; custom-designed tone shaping switches, and simplified controls with solid brass knobs; 24-fret, double-octave range; wenge fingerboard; swamp ash body. Test the Growler with caution, because it will chase after you until you have your own. despite the extremely stylish look, this is a performing bass and it’s made to be played. Don’t let the beautiful, sleek and stylish look of this bass distract you. The Tobias bass Classic is built to perform. The Classic offers the widest range of tonal wood combinations to deliver everything from the clarity of the low end to the sweetness of the high end. The sound that bass players seek but seldom find. Despite the extremely stylish look, this is a performing bass and it’s made to be played. 3-layer wings are composed of lacewood, wenge, and walnut. 7-piece dual truss rod, Asym neck fits the hand perfectly, plays naturally and effortlessly. With Tobias’ versatile control and pickup layout, no sound or style of bass is beyond your reach. deliver everything – from the clarity of the low end to the sweetness of the high end. Clearest lows, sweetest highs – these musical instruments are built to perform, delivering everything from the clarity of the low end to the sweetness of the high end. Neck-thru construction and choice tonewoods give the Classic Tobias bass the sound that bass players seek but seldom find. Despite the extremely stylish look, this is a performing bass and it’s made to played. 3-layer wings are composed of lacewood, wenge, and walnut. 7-piece dual truss rod, Asym neck fits the hand perfectly, plays naturally and effortlessly. With its versatile control and pickup layout, no sound or style of bass is beyond your reach. Neck-thru construction and choice tonewoods give the Classic Tobias Bass Guitar the sound that bass players seek but seldom find. Despite the extremely stylish look, this is a performing bass and it’s made to be played. 3-layer wings are composed of lacewood, wenge, and walnut. 7-piece dual truss rod, Asym neck fits the hand perfectly, plays naturally and effortlessly. With the versatile control and pickup layout, no sound or style of bass is beyond your reach. it will meet the demands of any music from reggae to rock effortlessly. The two-piece body and five-piece Asym™ neck make it a solid masterpiece of modern bass design. The strict quality control standards ensure you receive the best handcrafted instrument made. Features of the Tobias bass guitar 6 string Basic: beautifully handcrafted, professional-quality instrument, and a masterpiece of modern bass design. It will meet the demands of any music from reggae to rock effortlessly. The 2-piece maple body provides a deep, clear, resonance. The neck is a 5-piece, dual truss rod, Asym thru-body design with a pau ferro fingerboard and mother-of-pearl position inlays. It plays easy on the hands and has a wonderfully smooth feel. The BASIC 6-String also offers an amazing tonal range. State-of-the-art electronics include Bartolini pickups, 3-band EQ, a mid cut/boost switch, a blend control, and a push/pull Slap Tone switch. The “BASIC 5-String” model – It could be any other company’s top-of-the-line. This Tobias Bass Guitar is a beautifully handcrafted, professional-quality instrument, and a masterpiece of modern bass design. It will meet the demands of any music from reggae to rock effortlessly. The 2-piece maple body provides a deep, clear, resonance. The neck is a 5-piece, dual truss rod, Asym thru-body design with a pau ferro fingerboard and mother-of-pearl position inlays. It plays easy on the hands and has a wonderfully smooth feel. The Tobias bass guitar 5-String Basic also offers an amazing tonal range. State-of-the-art electronics include Bartolini pickups, 3-band EQ, a mid cut/boost switch, a blend control, and a push/pull Slap Tone switch. can handle any style of music, from rock to reggae, from jazz to blues. Whether it’s Rock or Reggae, the Tobias Bass BASIC 4-String will effortlessly handle any demand. Tobias calls this the “Basic 4-String” model. It could be any other company’s top-of-the-line. It is a beautifully handcrafted, professional-quality musical instrument, and a masterpiece of modern bass design. The Tobias Bass guitar features all the essentials that have made Tobias the first choice of professional bassists. With a MultiLam neck-thru design and a broad selection of tone woods for body wings, the Basic can handle any style of music, from rock to reggae, from jazz to blues. The 2-piece maple body provides a deep, clear, resonance. The neck is a 5-piece, dual truss rod, Asym thru-body design with a pau ferro fingerboard and mother-of-pearl position inlays. It plays easy on the hands and has a wonderfully smooth feel. The BASIC 4-String also offers an amazing tonal range. State-of-the-art electronics include Bartolini pickups, 3-band EQ, a mid cut/boost switch, a blend control, and a push/pull Slap Tone switch. Why Should I Consider Buying a Tobias Bass Guitar? 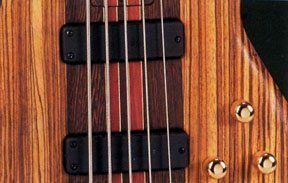 Unlike most bass companies who use a popular guitar neck design with fat strings, Tobias considers a bass player’s special needs. The Asym neck is asymmetrically contoured for a bass player’s hand to increase playability and reduce hand fatigue. You have to play an Asym neck to appreciate the difference. You’ll never find another neck that feels as good as a Tobias!